How to get me to buy an issue of Wolverine and the X-Men. How to get me to buy an issue of Wolverine and the X-Men . Funny. 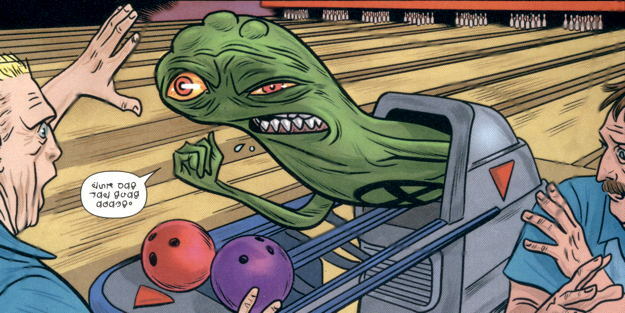 I was at my LCS yesterday and a customer started translating the Doop-ese in WatXM #17 to English and then, on paper, to Interlac and Klingon. One of those thankfully rare moments where I experienced simultaneous feelings of awe and revulsion. The participation of Jason Aaron and Mike Allred isn’t enough to get you interested? Wow. Chance – There are lots of creators I like who work on properties I just don’t have any interest in. This issue also had a one page Doop/Howard the Duck team-up, something I never knew I wanted until it actually happened. I had the same: never had I thought I would buy an issue of Wolverine & the X-Men. But I when I knew Doop would be in it, I had to have it (my favorite was Doop layin’down the funk).